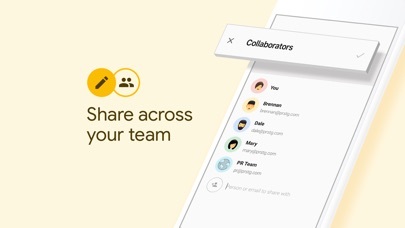 • Capture, edit, share, and collaborate on your notes on any device, anywhere. • Add notes, lists, photos, and audio to Keep. 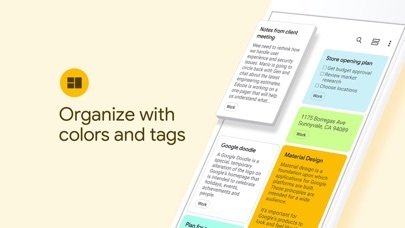 • Organize your notes with labels and colors. • Set and forget. Get reminded about a note at the right time or place. • Record a voice memo and have it automatically transcribed. • Grab the text from an image to help you quickly find that note again through search. WHEN AND WHERE YOU NEED IT Need to remember to pick up some groceries? Set a location-based reminder to pull up your grocery list right when you get to the store. Need to finish a to-do? 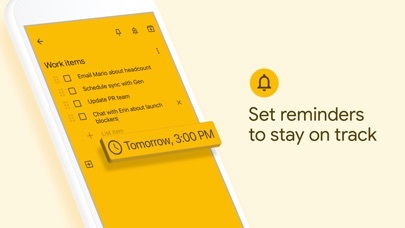 Set a time-based reminder to make sure you never miss a thing. SHARE YOUR THOUGHTS WITH FAMILY AND FRIENDS Next time you go to the store, share your shopping list on Keep and watch as items get checked off in real time. No need for text messages back and forth. Get things done together, faster. FIND WHAT YOU NEED, FAST Quickly filter and search for notes by color and other attributes like lists with the label “To-dos”, audio notes with reminders or just see shared notes. Find what you're looking for even faster, and let Keep do the remembering for you. ALWAYS WITHIN REACH Keep works on your phone, tablet and computer. Everything you add to Keep syncs across your devices so your important stuff is always with you. 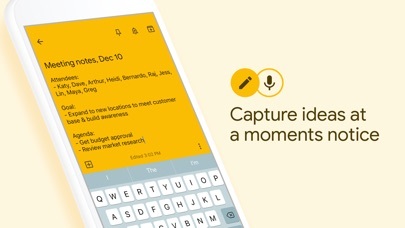 Try Google Keep on the web at http://keep.google.com and find it in the Chrome Web Store at http://g.co/keepinchrome. Permissions Notice Camera: This is used to attach images to notes in Keep. Contacts: This is used to share notes to contacts. Microphone: This is used to attach audio to notes. Location: This is used to set and fire location-based reminders. Storage: This is used to add attachments from storage to their notes. Good for sharing between android and iOS. I use this on an old ipad2, vintage 2012, iOS 9.3.5. Was getting the "can't connect now, will retry later" error. Deleted the app and reinstalled. Now it works fine. The only problem is that the notes don’t fill your screen when you open them so it feels cramped. The note should fill the screen. Adequate app for keeping small tidbits of information. Yet when it starts up when I have a slow connection, I get a blank screen for about a half-minute, and there goes the thought I was trying to save. This is why I use the built-in iOS Notes app for something quick, then if it’s important I paste it in Keep later. Also freezes when I save to Keep on a slow connection. This app requires full text search. There is no date and time stamp. A note I created couple of years ago says at the bottom: “Edited Mar 30” that’s it. Which year, what time. Nothing. Terrible. This is feature is available for Android, BUT NOT for iOS!!!! My keep app needs to ‘refresh’ seemingly almost every time I open it. This is not a 10 second phenomenon, it tends to take upwards of a minute or longer on average. This was never an issue for years. I keep my life in here. I love this app. But you’re driving me crazy with the ‘refresh’ requests. Great app, but could add more. 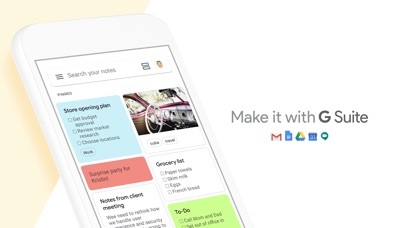 I absolutely love Google Keep to organize my notes, but I wish you could add the ability to lock notes, especially for privacy or when someone hacks your account and they take access of your notes, especially when they are very private or confidential. Also, I’d love if you add more colors to notes, that would be awesome! Thank you. Quick to write notes, store images. Quick to search info. Available to all platforms. Thank you google! Synchronization and note sharing are just terrible. Propagation of changes takes forever, or does not happen at all (lists shared with me are just incomplete): this is a critical bug making the application essentially unusable. Android app is flawless.